This satellite image obtained from NASA shows Super Typhoon Haiyan over the Philippines on November 8, 2013. 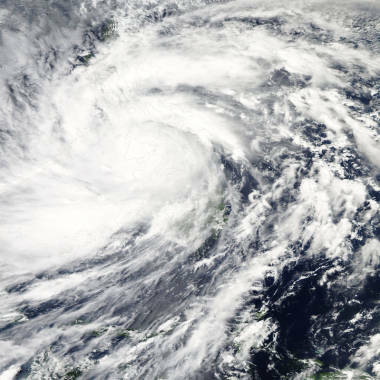 One of the most intense typhoons on record whipped the Philippines Friday, killing at least three people and terrifying millions as monster winds tore apart homes. Deadly Typhoon Haiyan pummeled the Philippines with nearly 200-mph winds, causing mudslides, flash flooding and waves of up to 30 feet high -- and experts said this kind of storm may be more common in the future. "Some global warming scenarios suggest that the oceans will warm two degrees by 2100, which could increase hurricane winds by 10 percent," Jeff Masters, director of meteorology at Weather Underground, told NBC News. A Category 5 hurricane, the storm formed on Aug. 19, 1969 and claimed the lives of 259 people. Winds, which reached speeds of 190 mph, pummeled Mississippi as well as nearby states. The storm surge climbed to 24 feet and the cost of damage was an estimated $1.41 billion. More than 400 people died after the Labor Day Hurricane made landfall in the Upper Keys of Florida on Sept. 2, 1935. With winds that roared at 200 mph and a storm surge that reached 17 feet, the storm became one of three in the U.S. to be listed as Category 5 storms -- the other two being Hurricane Camille and Hurricane Andrew. The super typhoon made landfall on Oct. 18 and hit the Philippines with winds of 145 mph. Dozens of people died and the cost of the damage was calculated at more than $700 million. Fifteen years before Typhoon Haiyan and 12 years before Typhoon Magi, Typhoon Zeb boomed through the island of Luzon in the Philippines on Oct. 10 with 125 mph winds, claiming the lives of almost 100 people. The cost of the damage caused by the Category 5 storm was estimated at more than $830 million. Winds reached upward of 180 mph and set Australia back more than $5 million in damage repairs after Cyclone Monica blew through on April 19. No fatalities were reported, and although there was little structural damage, officials reported that the Category 1 storm caused high environmental damage to forested areas. This Category 5 hurricane made landfall on Aug. 14 and hit Mexico's Yucatan Peninsula with 175 mph winds. There were 13 confirmed deaths with a damage estimate of more than $180 million. A popular cruise port was damaged along with thousands of homes, displacing at least 15,000 families. The tropical cyclone slammed the island of Mindanao on Dec. 3 with wind gusts of 175 mph. More than 1,145 people died as a result of the Category 5 super typhoon and more than 830 people were reported missing. Thousands were left homeless after the storm charged the area, causing an estimated $1 billion in damage. NBC News' Alexander Smith and Wunderground.com contributed to this report.